High-speed wind tunnels are one of the coolest things on Earth. The ability to feel like you’re skydiving while not having to actually jump out of a plane thousands of feet in the air is a pretty sweet deal. Now, just imagine being a Red Bull athlete equipped with LED light suits and a free high-speed wind tunnel to experiment with. Well, Red Bull “Air Force” athletes Jeffrey Provenzano and Amy Chmeleck recently performed all sorts of crazy skydiving stunts/aerobatics while wearing glowing LED light suits inside of a wind tunnel. 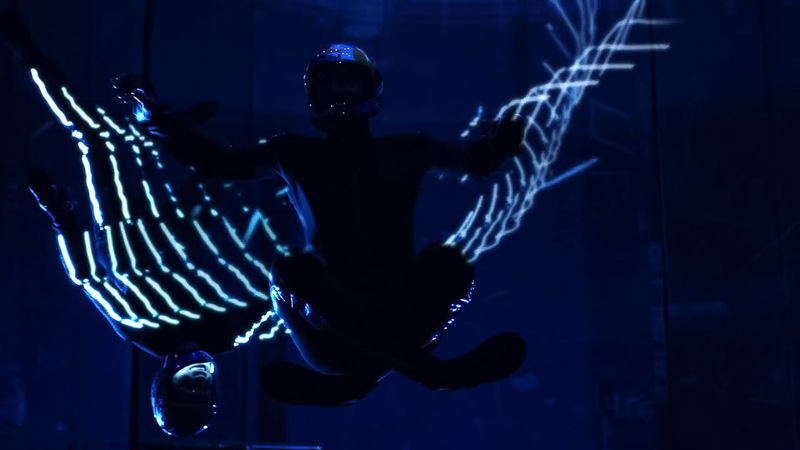 Red Bull Air Force Athletes Jeffrey Provenzano and Amy Chmelecki combine skydiving aerobatics and custom LED light suits inside a high-speed wind tunnel. This dreamy flight traces perfectly timed maneuvers through the air creating a long-exposure effect typically associated with photography. “Jeffro” is best known for his talent for inventing never-before-seen aerobatics. Watch what happens when he flies After Dark.